The first pro-life campaigner convicted under Queensland’s new abortion laws has been schooled by a magistrate for protesting inside an abortion clinic “safe access zone”. Source: The Courier-Mail. The magistrate told him he was “another man telling women what to do with their bodies”. 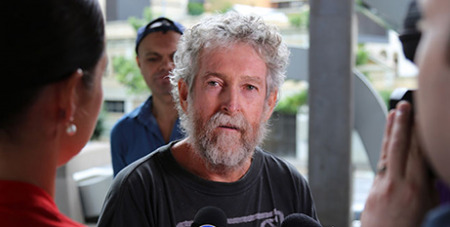 Serial protester and devout Catholic Worker Movement member James Dowling, 63, was charged with the new offence after being arrested outside a Brisbane abortion clinic on Boxing Day with a sign that read: “Human rights for all human beings”. Representing himself, Mr Dowling fronted Brisbane Magistrates Court yesterday charged with protesting inside an abortion safe-access zone but refused to enter a plea, claiming he did nothing wrong. “I was exercising my right to free speech,” he told the court. But magistrate Andrew Moloney entered a not guilty plea on the defendant’s behalf to the charge of engaging in prohibited conduct in a safe access zone outside a termination clinic. Police prosecutor Duncan Erskine said police were called to a man protesting against abortion outside Brisbane Day Hospital on December 26, 2018, after reports of protesters with signs saying: “Support mothers not abortion”. The Palaszczuk Government’s newly-minted abortion laws make it illegal to protest with signs or make noise in a “safe zone” within 150m of an abortion clinic, if it could “reasonably deter” a woman from seeking an abortion. Mr Dowling was 10m away from the clinic’s entrance on Logan Road, the court heard. He told the court that he had been protesting outside the clinic each December since 1982 and despite being subject to abuse for a number of years he had “never retaliated”. “I just don’t believe the law is a just law that wants to throw me in jail for exercising my right of free speech, trying to save lives and help women,” he said. In sentencing, Magistrate Moloney told Mr Dowling: “At the end of the day it is another man telling a woman what to do with her body”. Mr Dowling was fined $300 and had a conviction recorded. His wife, Anne Rampa, 58, who has also been charged with the same offence, will have her matter heard in the Brisbane Magistrates Court next Tuesday.